combined with the most complete search tool to help RFID professionals find the best RFID tags for their applications. SlimFlex Tag Standard-301 and SlimFlex Tag Standard-200 make the HID Global SlimFlex™ Tag family of flexible yet rugged UHF RFID tags even more complete and interesting. The new products are primarily designed to be easily and quickly installed by means of cable ties. Besides easy removal and re-location, this installation method allows secure mounting without adhesives on assets that cannot be drilled and opens up completely new use possibilities like tagging of sacks and a variety of difficult-to-tag objects in mining, construction and other harsh indoor and outdoor environments. Both these flexible, versatile industrial RFID tags feature a special ThermoPlastic Elastomer encasement that provides high durability, surviving many aggressive chemicals, demanding mechanical and thermal stresses, prolonged immersion in water and exposure to UV rays. SlimFlex Tag Standard-301 and SlimFlex Tag Standard-200 come in yellow color to grant high visibility and excellent contrast when laser-engraved with custom barcodes, numbering, text or logo. Designed to perform on plastic, wood and other non-metallic surfaces with read range up to 8 meters, SlimFlex Tag Standard-301 is an ideal solution for tagging of plastic pipes, cables and hoses, bag handles, trees and other rigid or flexible tubular objects. 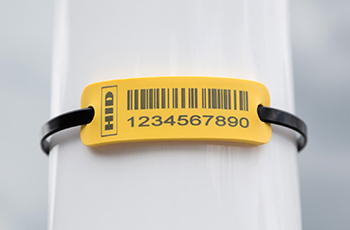 The tag measures 87 x 25 x 3 millimeters and can be fixed not only with cable ties, but also with screws or industrial glue. The SlimFlex Tag Standard-200 model offers even higher level of versatility as it is designed to be mounted vertical to the asset surface using a cable tie. This means that SlimFlex Tag Standard-200 can be used on any surface, even if metallic or wet, without any degradation of the reading performance. Providing read range up to 8 meters in worldwide use, this tag model is ideally suited for small pipes, beverage kegs, gas cylinders, fire extinguishers and other cylindrical assets. SlimFlex Tag Standard-200 measures 83 x 25 x 3 millimeters can also be attached to non-metallic surfaces by using industrial glue. 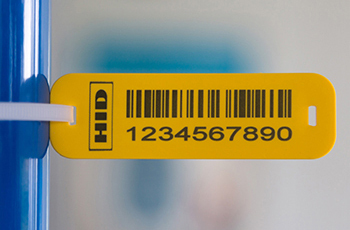 Contact HID Global for more details on these versatile industrial RFID tags, or access the RFID Tags Database. This entry was posted in RFID News, RFID tags and tagged HID Global. Bookmark the permalink.